Algae in tubels mimicking the photosynthesis process in order to tap sufficiently energy from the sun. is natural process that use microorganisms in the photosynthesis to convert sunlight into usable photovoltaic cells for energy. Photosynthesis is the key processes on on Earth where primary energy producers like planets. However, is not only the plants that can do photosynthesis there are group of microorganisms mainly cyanobacteria , protistans and algae that can also able to photosynthesize sunlight into a biological energy. The biotechnology has invented good innovations and techniques of harnessing these microorganisms or remodeling some innovative process of re-modify organisms biologically, of course there are great deal of biological variations that can be explicitly deployed to improve photosynthesis. 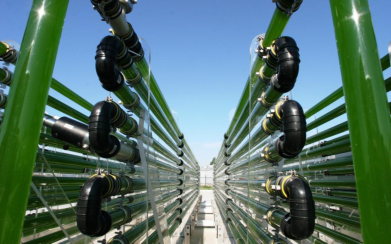 The Wageningen Research Center's video demonstrating on how algae being harnessed for bioenergy. Production of these cells is intrinsically inexpensive. The biological materials used are not rare. The cells can produce liquid fuels directly. 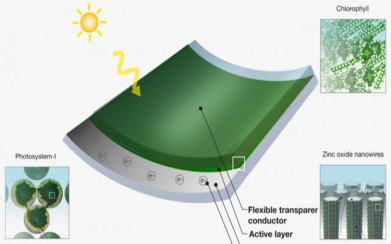 BioSolar Cells can capture the greenhouse gas CO2. BioSolar synthesizer (bioreactor) is a technical system that mimic photosynthesis process in order to tap sufficiently energy from the sun. In generally we know that all energies are derived primarily straight from the sun using photovoltaic cells or photobiological cells that found in some microorganisms like algae and protozoa that have a chloroplast such as diatoms,marimos,amoeba and others that convert sunlight automatically into biological energy through the process of photosynthesis. While we are discussing this very interesting topic let me emphasizing the importance of renewable energy on African continent:The initiative projects of harvesting and harnessing solar power in African nations will be an important step toward accomplishing what we called "Industrialized Age" through improvement and investment into solar technologies, Africa's states can increase affordable energy to all remote villages, 'remember that energy is the power behind every type of development we seeing around the world, therefore a nation without any affordable energy dedicated for its less privileged masses everything will stand at still. 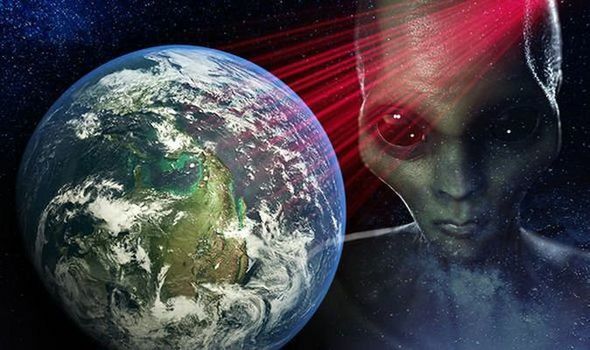 "African continent got extra advantage for free available natural gift from God, in actually sense Africa has many potentials to develop a solar technology that very complex than any other continent or regions like other parts of Europe,Asia and Tundra that lay very far from main equator, which is the "Ra" [mother] of the Sunlight". 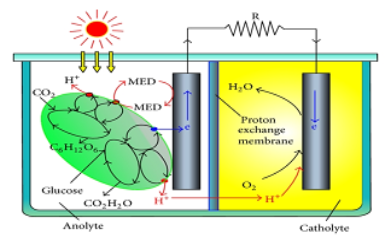 Africa has huge accessibility to the cold Atlantic ocean that house quite deal of green algae and purple microbes in deep sea that needed to build a Bio-solar synthesizers [ bioreactors] for generating energy to provide a free-cost and sustainable energy to all households. African nations especially Namibia have greater option available for us by tapping unlimited energy of sunlight throughout the daytime, so it's a call to the challenge to make use of this incredible resource laying idle at our disposal. BioSolar has many advantages over the ordinary Solar power that convert sunlight energy using panels made out of aluminium-alloys. According to researchers in Japan and Netherlands who leading this breakthrough in biophotosynthesis research, they concluded that a bio-inspired solar power energy system can provides high yield energy more efficiency than the traditional solar power. Since BioSolar energy provide power through a technical modified photosynthesis, that mimics a normal chemical process of phytoplanktons, Algae and some bacteria that lives in places where sunlight saturation is less but, these microbes convert more energy from the sun under those environmental constrains. To understand this better, we must take the natural photosynthesis process that occurs at the pelagic zones [ocean floors] as an example, where there is a limited or even no spot of sunlight, but yet these algae and cyanobacteria that formed up a bioprocess at the pelagic zone these microorganisms make sure that enough sun's rays via the body of waters which is about thousand kilometers from the main water surface. The bioprocess allows pelagic photosynthesis to produce energy that needed in replenishing the lifeforms in those deep ocean trenches such as the "Mariana Trench" the most deepest abyss in the world which is about 10 km deeper below the sea's floor. The BioSolar arrays [tubes] may only need a narrow exposure of sunlight for a short period of time to provide extra kilowatts of energy sometimes in a severe bad weather, incomparable to conventional solar power that require a constant visibility of sunlight.